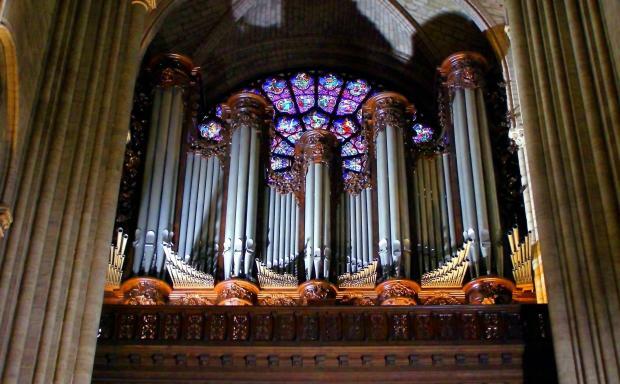 The historic organ at Notre Dame Cathedral has survived Monday's devastating fire, according to initial reports. The organ has a staggering five keyboards and more than 8,000 pipes, some going back to the middle ages. It dates back to 1730 and was greatly modified over the years. Paris's deputy mayor was quoted as saying that the organ, one of the biggest and most famous in the world, remained intact after the fire. Emmanuel Gregoire told BFMTV that a plan to protect the cathedral’s treasures had been rapidly and successfully activated. The BFM Paris tweet has a clip of the spokesman of Notre Dame saying he had gone into the nave, and the rose windows were all there. The organ might have some water damage, but not burnt at all.